insulator | Poverty, Agony, Distress & Want! Soaring eagles and killer blackflies! I was lucky to get out with my life. They were huge, and there were a lot of them…actually clouds of them. It was like a scene out of the Walking Dead; hordes of blood-thirsty man-eaters looking for blood. They were inescapable, around you wherever you went and did. And no matter how many you killed, there were always more swarming around you. My body bears the scars of my harrowing escape-scars that have not yet healed. Facetious, always; funny, maybe; based on a true story; you betcha! Hope you like my attempt at literary wit. So I’m back kids! After a well-deserved week break, I’ve returned to the keyboard, more or less in one piece. Obviously I’ve been referring to the swarms of mosquitoes and black flies I encountered on my expedition this weekend (the bites of which I am still scratching while I type). The respite was nice; I was actually too busy to write more than anything else. But we’ll just say it was a vacation. So speaking of vacation, there’s only 7 days left until exams…halleluiah! I know, I know, poor teacher, two whole months of holidays to worry about. I need a break though. The last few weeks have been crazy and very stressful; I need to get away for a bit and recharge the battery. Even as I sit here and write my head is pounding and I’m thinking about the essays beside me I need to mark. I guess soon enough I’ll be able to clear my mind and just focus on my family and some me stuff for a while. One of the things that kept me from writing last week was our annual spring football camp. I know it was only three days, but it does take up quite a bit of time in what is already a very hectic period. It was worth it though; 26 Grade 9’s and 8’s came out to prepare for next season. We did a couple of days of drills followed by a game of two-hand touch to wrap up the camp. I always love that last day as the coaches get involved as well…it’s nice to be out on the field for a change. I had a ton of fun-had a big stretch pass break-up and a pick six, but boy did my body hate me the next day! My hip flexors were so tight I could barely walk. Must be getting old! On a positive note, we have finally moved the program into the next arena of social media; you can now visit us on Facebook! On Saturday I finally made it out to my second railway “hike” of the year. I use the term hike lightly, as there wasn’t a heck of a lot of walking done, mostly exploring you could say. This adventure took me and the boys back to the North Lake area, somewhere we hadn’t been since last spring. 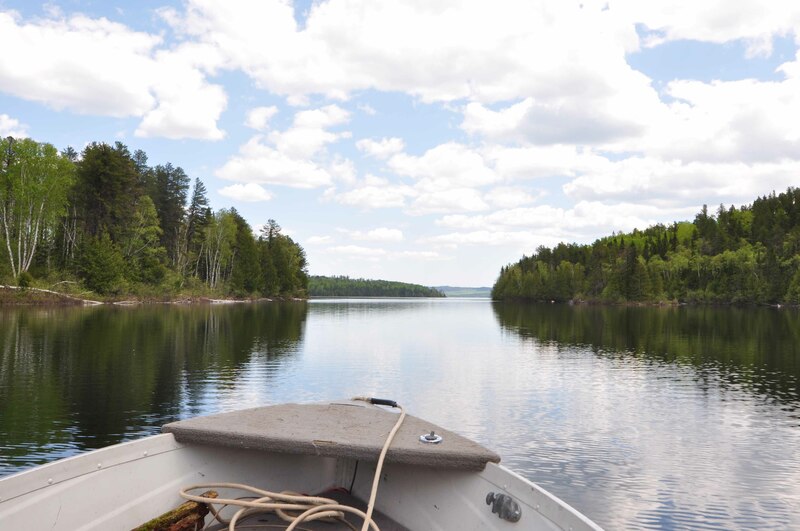 That trip took us to Little North Lake (west of North Lake) in search of telegraph poles and insulators. I made a big discovery of an intact insulator still attached to the wire beside the rotten remains of the pole; I was determined to find more. The drive to North Lake is about 105km from my house, which normally takes about an hour and a half. However, since I was going to be towing my boat, I would need to drive a bit slower this time around. It was a beautiful morning and the lake was very calm and tranquil. By 10:30 we were heading west across the lake toward Trestle Bay. 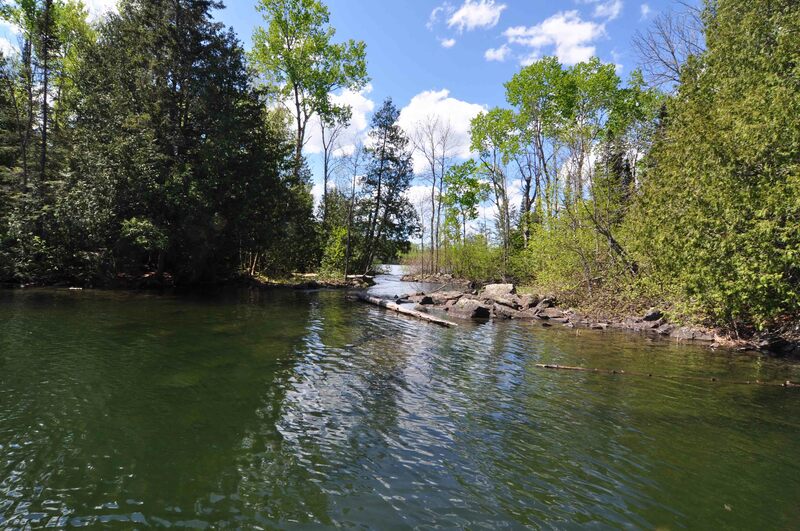 My newer, bigger boat made the 4.5km journey much quicker and in 10 minutes we had arrived at the site of the once mighty 1000 foot trestle that spanned the bay. I always love visiting Trestle Bay, and while I’m there try to imagine what the trestle used to look like that spanned this long bay. 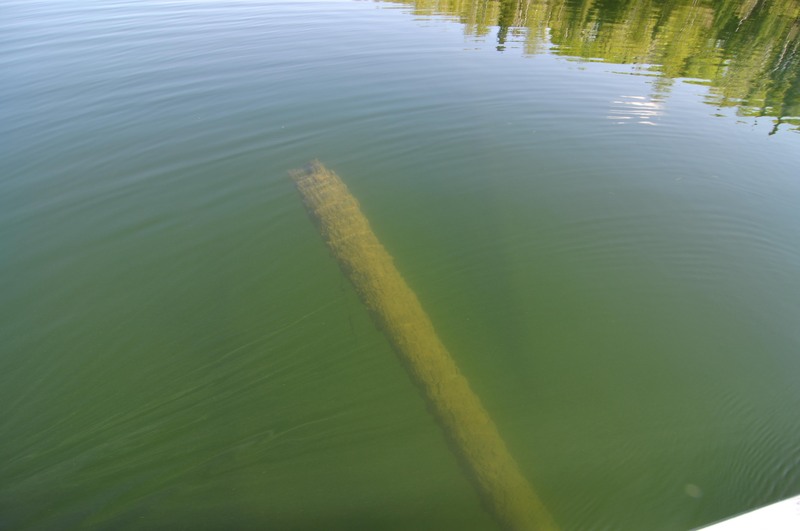 The water is very clear and the depth is fairly shallow (9-15ft), so on a calm day you can clearly make out everything resting on the bottom. 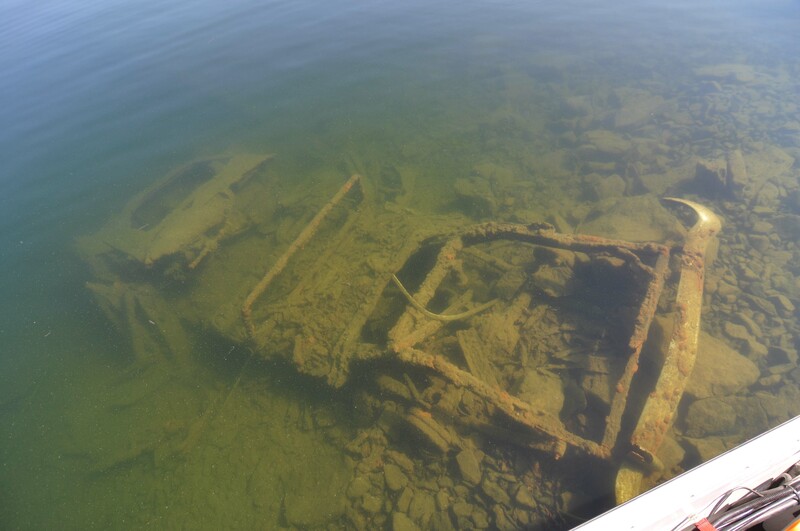 In addition to pilings and rails, there is a 1952 Pontiac sitting submerged on the side of a large rock bed (the chrome is still shiny). It’s a bit of a mystery as to how it got there. Eastern abutment, Trestle Bay, June 2013. Heading from the east side to the west is very neat, but also very freaky. 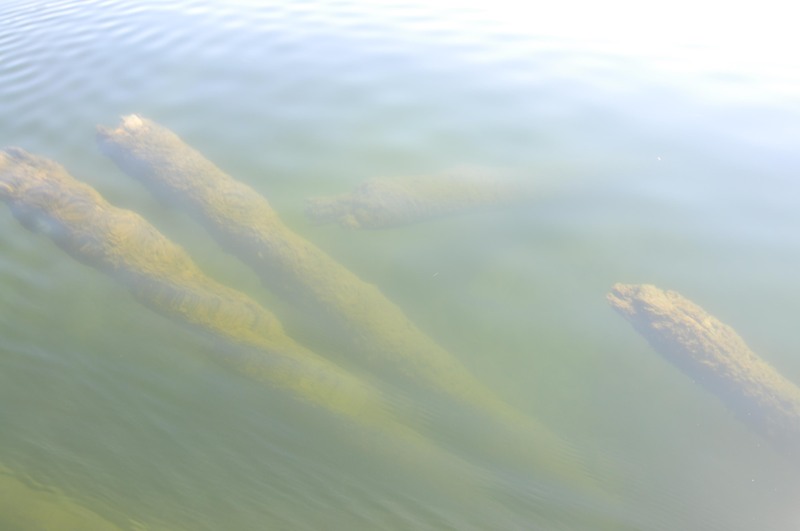 There are still pilings that jut upward from the bottom, massive 12+ inch logs still in their place 121 years after being driven through the mud to the bed rock. It’s kinda fascinating to see. Last year I was sent an image that was taken from the air in 2007 when the lake level was very low (the rock bed that today is 3 feet under water was above the surface). 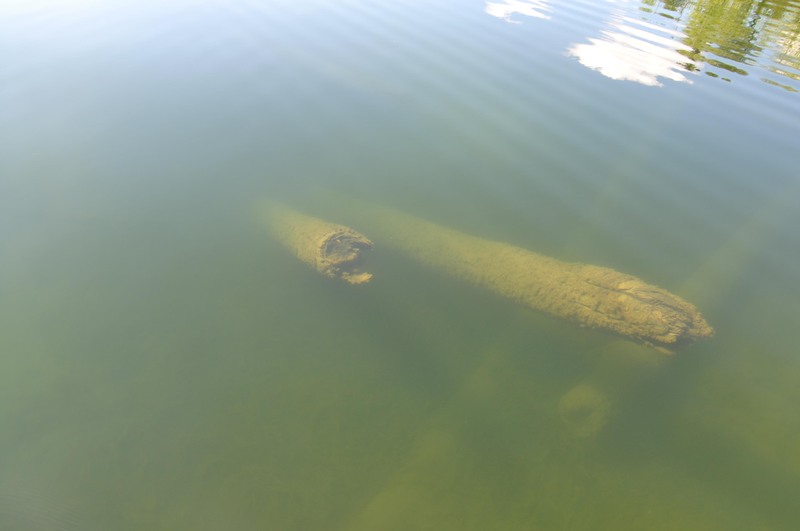 It almost appears as if the trestle is still there, hiding below the water. Trestle Bay, July 2007 (B. Rushton). From Trestle Bay we headed west toward the end of the lake and into the narrows that leads to Little North Lake. 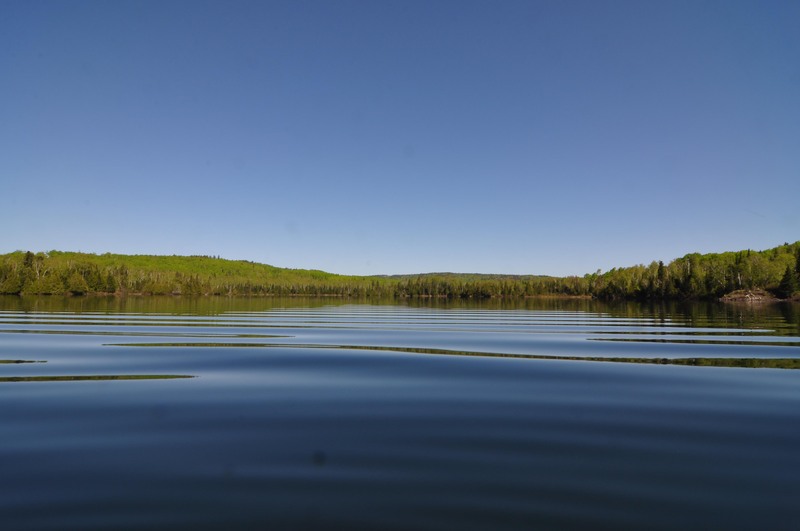 That area of the boundary waters is always breathtaking and on Saturday it was no exception. As we neared Little North I could see eagles soaring through the sky, looking for a meal or roused from their perch by the sound of our boat. I even caught one is the distance as I snapped a picture of the lake. I always wish I could spend more time on the lakes to see and experience their natural beauty. 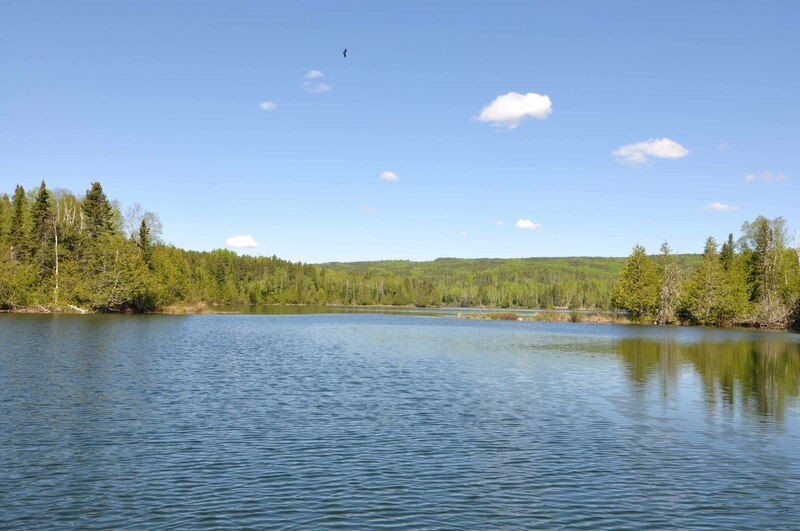 Little North Lake, June 2013. A few minutes later we arrived at the end of Little North, where the water spills westward through a small creek into Little Gunflint Lake. It was at this spot, presumably during the construction of the railway in 1892 (there is no definitive mention of it), that one of the most unique objects in the railway history was built. 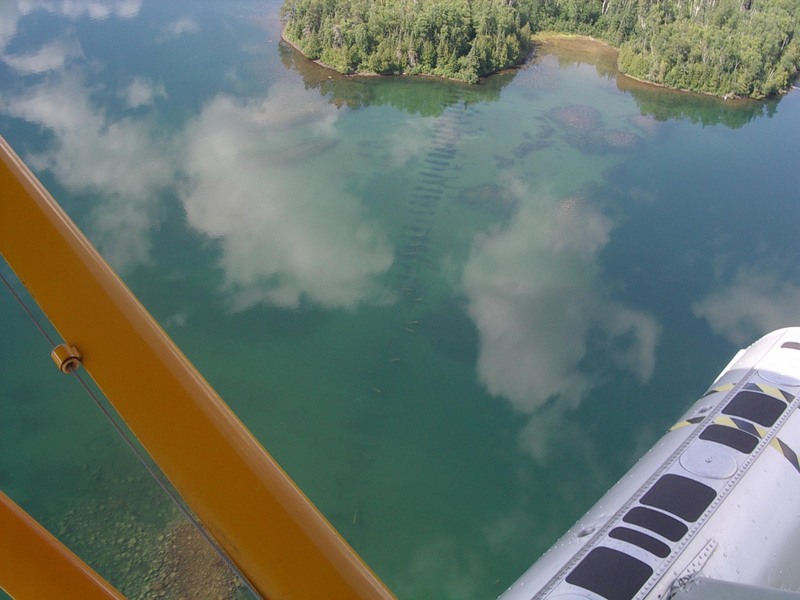 The creek itself is not very wide (and it looks as if its course was altered by the engineers), so they fashioned a marine railroad to move boats carrying supplies between the two lakes. 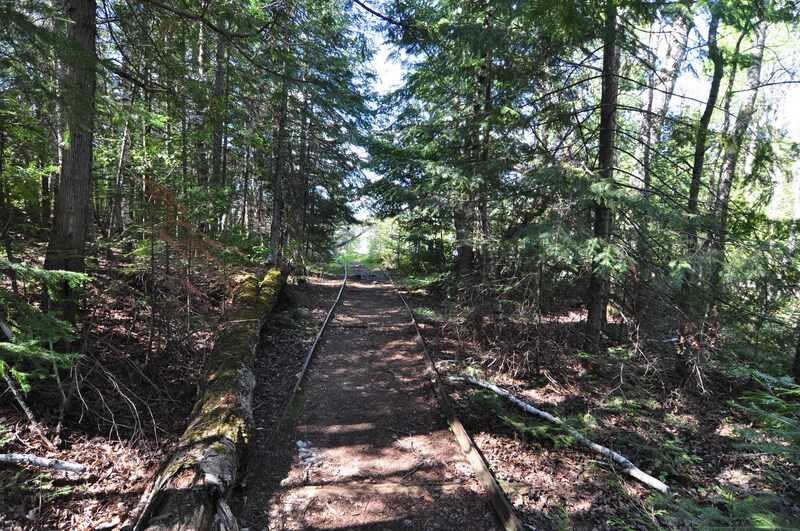 Small rails were laid across the spit of land between in the two lakes on the Minnesota side. A small cart with railway wheels was fashioned, attached to a manually operated capstan. This allowed the laden boats to be winched across to Little Gunflint, thus keeping the work crews far from the rail head well supplied. I was hoping to get some good video of what is left of the tracks and capstan, as well as the creek itself. However the water was high from our recent rains and so I decided to postpone until later in the year when the lake levels are lower. Marine Railroad, Little North Lake, June 2013. 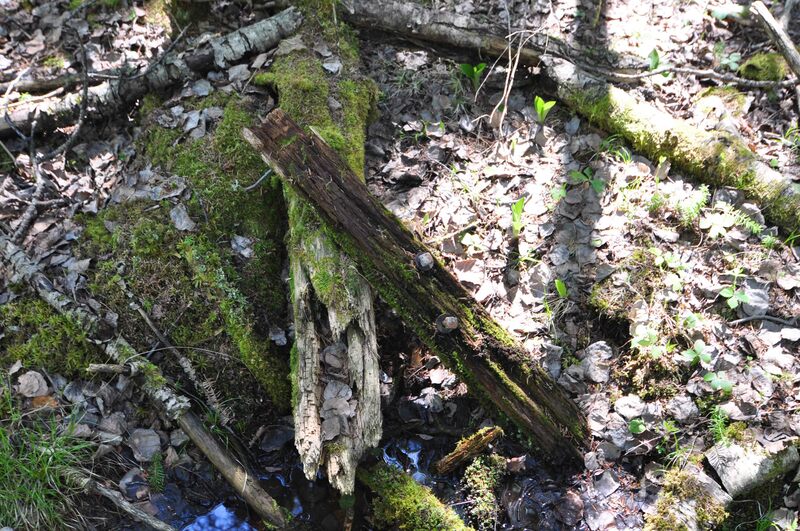 Creek between Little North and Little Gunflint Lakes, June 2013. I did poke around for some remains of buildings north of the grade. I figured that these buildings were the Ontario Forest Ranger cabins indicated on another old map. I didn’t see any foundations or anything, but it has been a long time. I did find some old cans, but it’s tough to spend a lot of time in one place, especially when you have young kids with you. Back in the boat we went another 1000m back toward the east end of the lake. It was at this spot that I had found the intact insulator. My goal was to grab some of the wire (to preserve the authenticity of it) and maybe find more poles and insulators. When we arrived at the spot, I grabbed the piece of attached wire and immediately began following the rest of the wire through the bush. It is rather tough, since the wire in many cases has been on the ground so long that trees have now grown over it. The initial piece led to a dead end, as did another piece I found a short distance away. About 150m to the east I found a shard of an insulator beside a round hole in the ground, which could have held the pole. The bush then became very grown in, so I decided to turn around and head west. I walked about 150m west from the previous site until it once again became very dense growth. I was a bit disappointed, but I thought that I should retrace my steps, this time a little closer to the grade. My perseverance paid off, for lying next to a tree and previously hidden from my view was another intact insulator (the tree had grown on top of the wire). 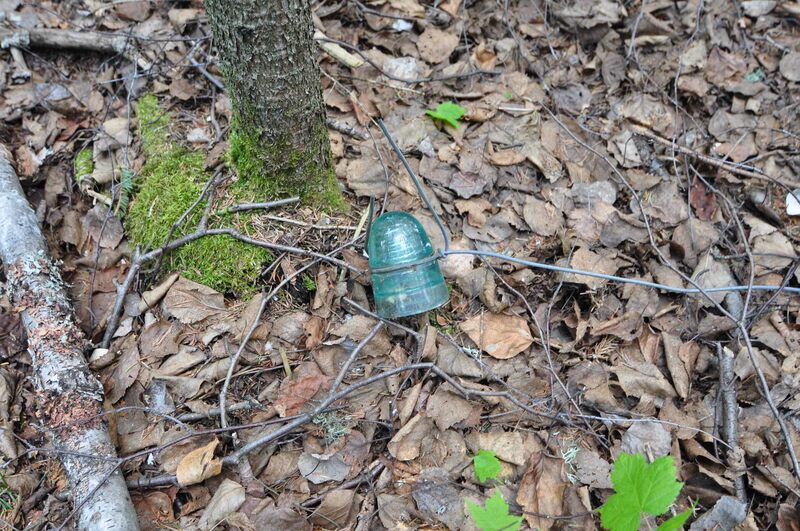 This time I snapped off the wire away from the insulator and coiled it around a tree branch for easier retrieval. I obviously was quite excited by the find and it makes me want to go back and look for even more. I need to get a metal detector so I can find the poles and wire in the ground! After my great find I realized it was now getting close to 2 o’clock, so we needed to head back to the truck. Our decision was helped by swarms of black flies that had made walking around insufferable, despite an ample application of bug dope. It was also quite hot along the closed-in railway grade, so it felt good to get out on the open lake. Loading the boat also became quite the ordeal, as we were beset by more blackflies and mosquitoes. This is where I probably acquired most of my battlescars that I spoke so eloquently about earlier. 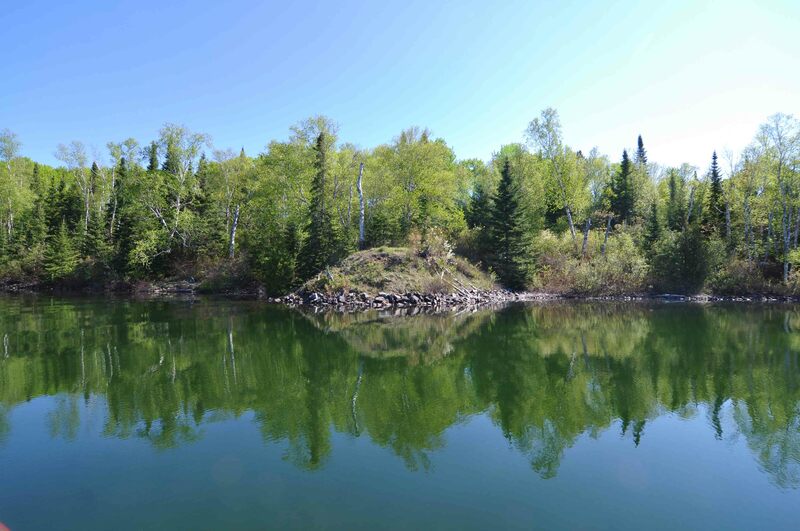 Little North Lake (ON left, MN right), June 2013. Unlike the two previous hikes/adventures of this year, I have a very short turnaround between trips this week. 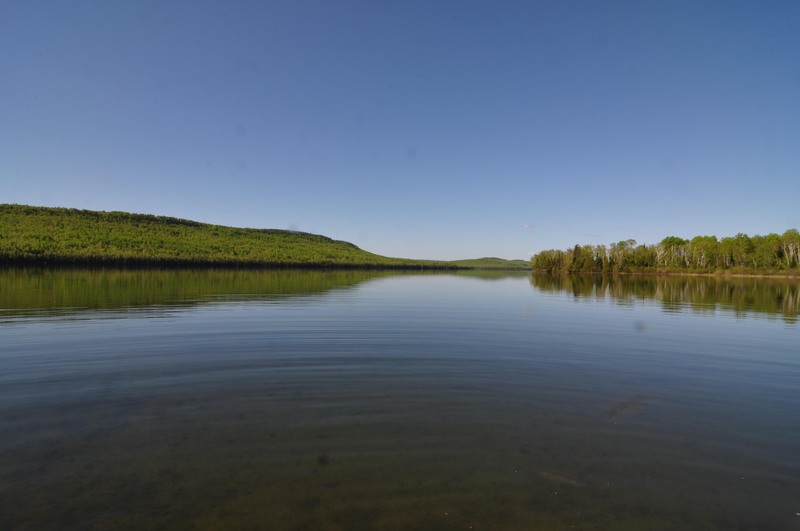 I have the day off on Friday, so I will be driving down to Leeblain on Gunflint Lake to do some exploring of what remains of some of the buildings that made up that ghost town. I’m pretty excited to see what turns up, though the drive diminishes some of that zeal. The road into Leeblain is one of the worst ones I’ve ever experienced and I don’t relish my trips over it. The last 20 miles into the lake are particularly pleasant and enjoyable!